In some ways, all first weeks of rehearsals are the same. It’s about a group of people coming together, getting to know each other, and laying the foundations for a show. Trust is no different. What does make it different is the script’s lack of linear narrative, named characters and even that many stage directions besides ‘pause’. The script is a jumping off point rather than a list of instructions. The process of creating the show is heavily collaborative, much closer to devising than rehearsing a conventional play. We talk about what the play makes us think of, and that in turn influences how we stage it. Influences at this point have included Mexican soap opera, Twin Peaks, Dreamgirls, Twitter threads, multiple break up songs, contour videos, Jeremy Kyle, and yoga, to name a few. We play the scenes influenced by those ideas, and then reflect on it. If it doesn’t work, it changes. It’s not difficult, mainly due to the lack of egos in the room. Both Pia and Zephryn (the actors), and Jude (the director) always seem to be on the same wavelength, building off each others ideas effortlessly. In week 2, we start looking at the scenes of the play in more detail, with costumes, props and some cool sound equipment (including this) in play for the first time. I’m excited to see how things will develop. 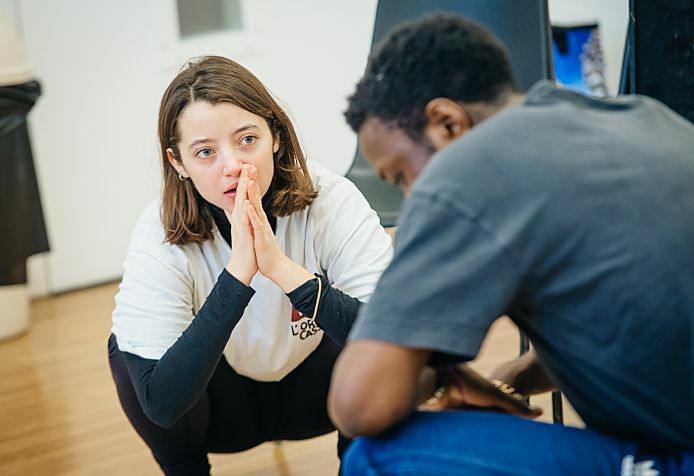 Array (  => Array ( [id] => 200 [created] => 1517243460 [updated] => 1517243460 [ordering_count] => 191 [intro] => Our assistant director for Trust, James Nash, gives us the inside scoop direct from the rehearsal room [title] => Trust rehearsals: Week 1 [slug] => trust-rehearsals-week-1 [category_id] => 12 [body] => In some ways, all first weeks of rehearsals are the same. It’s about a group of people coming together, getting to know each other, and laying the foundations for a show. Trust is no different. What does make it different is the script’s lack of linear narrative, named characters and even that many stage directions besides ‘pause’. The script is a jumping off point rather than a list of instructions.